These ready-to-use hand wash products offer an easy and effective way to disinfect hands and reduce the spread of germs. 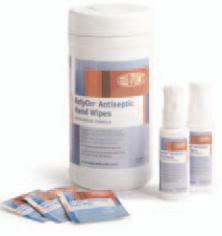 Effective against Hepatitis A, B, and C based on invitro efficacy testing. Available as personal-sized spray bottles, canisters of wipes, and individual wipes. Convenient way to reduce germs that can cause disease and infection. No sticky residue.